Coleraine fans could have been forgiven for feeling a little nervous despite watching their side race into a 2-0 inside 15 minutes on Saturday. Just seven days earlier the Bannsiders blitzed Linfield in similar fashion as Ian Parkhill and Brad Lyons gave them the upperhand. Coleraine's goalscorers at Solitude on Saturday, Brad Lyons, James McLaughlin and Rodney Brown pictured after the final whistle at Solitude. The Blues hit back though and grabbed a dramatic 3-2 win in the end. This week Rodney Brown and James McLaughlin put Coleraine in control against Cliftonville, but it was a lead they weren’t prepared to relinquish this time around. Brad Lyons added a third just after the restart as Oran Kearney’s men exerted their dominance on the game. The only blip was a late goal from Davy McDaid, but it was merely a consolation. “That’s right up there with our best displays this season,” Kearney told Times Sport after the game. “We went 2-0 up quite early on against Linfield last week and in some respects it was about seeing what lessons we had learned from that. “Unlike that game we didn’t ease off here. We didn’t invite Cliftonville on to us, we just kept at it and we got our rewards. “It’s a big day for a lot of our young players who had never won a match at Solitude before, so for them to play the way they did and come away with three points from a venue like this, it’s a great experience for them and something they will all want to build on. “We wanted a reaction from last week and we got it here. “It was the same kind of test with us going 2-0 up but we didn’t ease off or invite Cliftonville on to us. We kept at it and got our rewards. 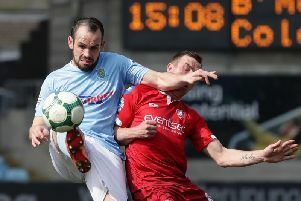 Cliftonville looked to be suffering a hangover following last weekend’s defeat by leaders Crusaders, which probably ended any lingering Reds hopes of regaining the league title. “The second goal comes at a good time and it’s a good finish, and to get the third just after half time was the killer I think,” said Kearney, who had special praise for opening scorer Brown. “Rodney’s had a tough couple weeks with injury. “He has been brilliant for us this season, he’s a great lad, he loves the game and has come to us to get football, and he has got a lod of football already this season. “He’s a great asset for us, in the air in paricular he’s such a threat, and he showed that again today with a great finish,” added Kearney.